Just a pointer to onetime University of Edinburgh Professor C.H. Waddington’s 1972 Gifford Lecture on framing the genes vs. environment debate of human behavior. 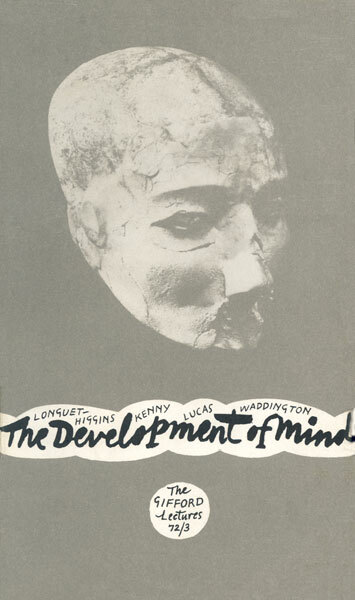 Although Waddington is famous for his work on population genetics and evolutionary change over time, several of his concepts are experiencing some resurgence in the neuroimaging and psychological development literatures these days. One term, CHREOD, combines the Greek word for “determined” or “necessary” and the word for “pathway.” It describes a system that returns to a steady trajectory in contrast to homeostasis which describes a system which returns to a steady state. Recent reviews on the development of brain structure have suggested that the “trajectory” (the actual term “chreod” hasn’t survived) as opposed to any specific time point is the essential phenotype to use for understanding how genes relate to psychological development. Another term, CANALIZATION, refers to the ability of a population to produce the same phenotype regardless of variability in its environment or genotype. A recent neonatal twin study found that the heritability of grey matter in neonatal humans was rather low. However it seems to then rise until young adulthood – as genetic programs presumably kick-in – and then decline again. Articles by neurobiologist Jay N. Giedd and colleagues have suggested that this may reflect Waddington’s idea of canalization. The relative influence of genes vs. environment may change over time in ways that perhaps buffer against mutations and/or environmental insults to ensure the stability and robustness of functions and processes that are both appropriate for survival and necessary for future development. Another Waddington term, EPIGENETIC LANDSCAPE, refers to the limitations on how much influence genes and environment can have on the development of a given cell or structure. Certainly the environment can alter the differentiation, migration, connectivity, etc. of neurons by only so much. Likewise, most genetic mutations have effects that are constrained or compensated for by the larger system as well. Its amazing to me how well these evolutionary genetic concepts capture the issues at the nexus of of genetics and cognitive development. From his lecture, it is clear that Waddington was not unaware of this. Amazing to see a conceptual roadmap laid out so long ago. Digging the book cover art as well!